It seems like this baby bump is growing bigger by the day now...I took this picture tonight (22 weeks 3 days) on the way to one of the worst dinner experiences of our lifetime haha. I kept meaning to take my belly picture over the weekend, but Matt has been busy getting his application material ready to take his PE Exam...so I just stayed in my cleaning clothes all weekend; relaxing and cleaning the house (sort of). I finally told him that it HAD to be taken before I grow another inch! After my first ever prenatal massage I threw on some clothes, took the pic, and headed to dinner. Maternity clothes? Be Band, rubber band, and stretchy clothes/dresses. I did receive my first official maternity shirts and a pair of maternity linen pants from Matt’s family for my birthday yay! Miss Anything? I walked past sushi at the grocery store and wanted to tear into all the packages like a raviness wolf…4 more months! Gender prediction: BOY! Matt called and asked if he could stop by the lego store on his lunch break. Belly Button in or out? My belly button is so wide and shallow that you can see my tan line (I had a super deep belly button before)…it looks freaky. Now that we know we have a little man on the way…let the shopping begin! This could get bad real quick… Matt had off for the 4th so we went to Carter’s to buy the first boy gear together (besides what my dad had bought “knowing it was a boy”). That was a fun experience, but I am sure I will not get Matt back there many more times. We also registered at BabiesRUs. Talk about overwhelming! I am pretty sure we have a lot of unnecessary and un-matching items. I kept hearing another woman say, “I have no clue what I am doing” and “How do I know if our baby would prefer to swing back-and-forth or side-to-side”…took the words right out of my mouth! By the end we were so drained that we just started scanning stuff with the intention of deleting the stuff we don’t need online later. Matt also felt the baby move for the first time this week. On two separate occasions he felt the kicks, but they are so small that he didn’t get as excited as I thought he would. He said it felt like my muscle was twitching. During the day (when Matt is not home), the baby goes crazy and I have started to see the kicks when they are above my belly button. 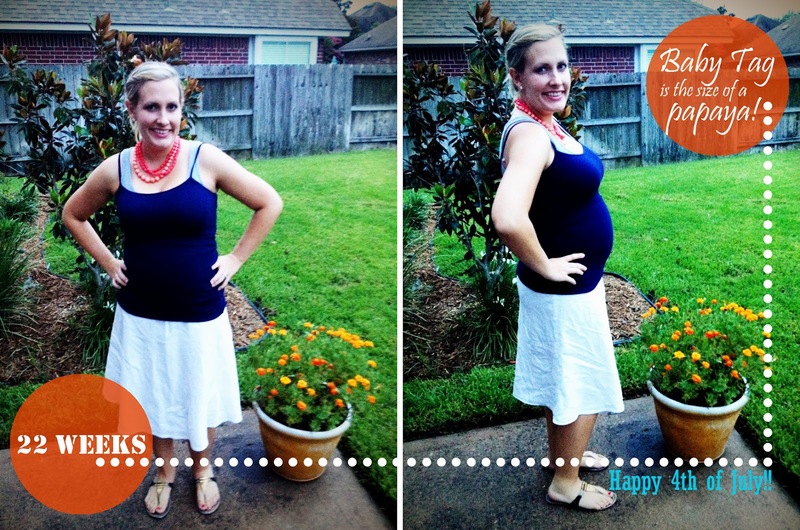 At 22 weeks exactly I was also kicked in the ribs for the first time…I guess I better get ready! It seems so early to have that happen, but I have NO torso so I guess that and my back-rib pain came early for me. Hopefully the prenatal massage helps with that and my regularly swollen ankles (which started on the Branson trip). As for the name…we have pages and pages that I put together. Then when I read them Matt says no to the majority. He doesn’t want a common name (like me), but doesn’t want it to sound made up (like me), but then doesn’t give suggestions…just shoots mine down. So the result will be our baby not having a name for A LONG TIME! Suggestions welcomed, but don’t get your feelings hurt if they are not used. ;) For now I guess I’ll call him Hanz. It is what we called my brother, Jake, until he was born and given a name. Hey, it is better than me saying “it” (because I am still not used to “he”) or still calling it an alien like I did in the first trimester. It'll take some time, but I'll get used to it. Gable was lost a year ago today, so it has been a bitter sweet day for me with lots of tears. I still look at the shelter website for her every day. I sometimes think that if she is in Heaven she is there with Lucky...watching over Bijou and their soon to be little brother. She would have been the most gentle and sweet "big sister", but I see Bijou getting more and more like her every day (in her own way). I will never forget that sweet girl and never give up! Love and miss you Gable girl!